A most engrossing and very entertaining talk entitled “Research of Gravestones” was delivered by Mrs. Kathleen Tansley of Hutton to members of the Society at their February 2009 meeting. The speaker ably assisted by her husband Peter spoke of the work she has done in recording and researching gravestones particularly those at Hutton, narrating some of the problems involved, illustrating the recording process and warning of the dangers of causing irreparable damage to the stones, by for instance over vigorously cleaning. When recording she stressed the importance of ‘never assuming’, far better to leave blanks than to make assumptions and perhaps thereby mislead subsequent researchers. She illustrated this from one inscription which to modern eyes might reasonably appear as John Garrity and indeed had previously been recorded as such but was in fact, as she had been able to prove from research she had done, should have read Laurence Pity. An easily enough made mistake when one fails to allow for the nuances and style of eighteenth century script with its different fonts and serifs. The speaker however was interested not only in recorded the actual transcriptions but perhaps more in getting behind the simple inscription and trying to work out what life would have been like by those whose names are remembered by those simple annals. She instanced one particular couple residing in the middle of the eighteenth century and tried to envisage what their lifestyle would have been, how much of Hutton they would recognise now and how they would have reacted to the great events of their day. This she had researched using a wide range of historical records including an extensive reading of some of the earliest published newspapers. She instanced too her own house as another history she had researched and revealed how she had uncovered much on the family living there well over one hundred years ago and how she tried to equate conditions then and now. Perhaps to some not the most absorbing of subjects this nevertheless proved a most fascinating and well received talk giving rise to an extensive question and answer session. 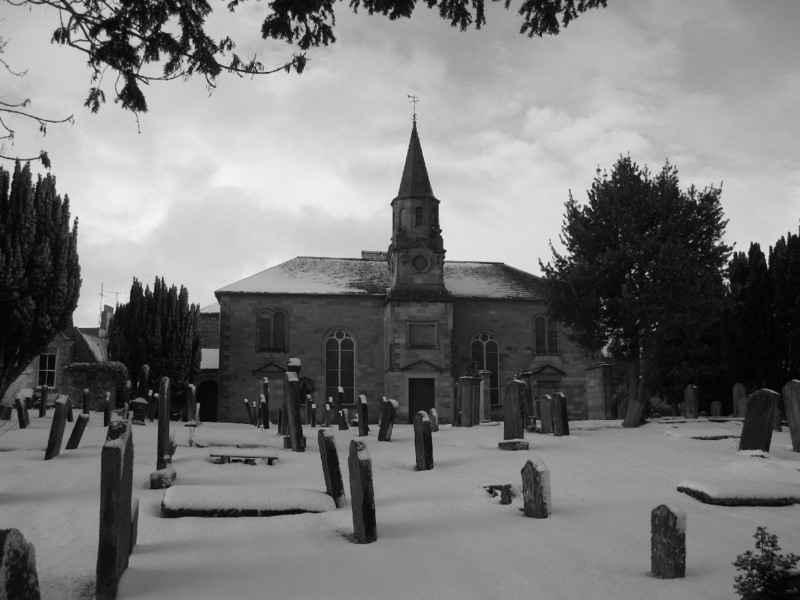 During this it emerged that the stones at Duns Parish Churchyard, Duns Parish Church had only been partially recorded and the suggestion was made that a full and detailed recording of the stones should be something the Society might consider undertaking. Because of weathering and other factors these historic inscriptions were being lost at an alarming rate.